Everest Academy: Online: "What Will I Be When I Grow Up?" Online: "What Will I Be When I Grow Up?" You can help your younger children explore possible answers to this question via the ACT Career Club, a prototype career discovery site in the Whyville virtual world. ACT invites students ages 8 through 15 to visit the ACT Career Clubhouse, where they can have fun while gathering information on as many as 555 unique occupations, grouped into six areas of interest ranging from science and technology to the arts. By playing an interactive digital game called CareerQuest, teens and tweens can investigate a wide variety of different occupations and potential careers—and discover professions that may surprise them. Whyville is a web-based virtual world that provides educational experiences through games and role-playing. Whyville "citizens" design their own avatars to travel among an array of clubhouses, shops, and museums. They have the opportunity to play for "clams," the official Whyville currency. Based on ACT's extensive research in education and the workplace, the Career Club is designed to be fun for students and a useful tool for parents and educators. 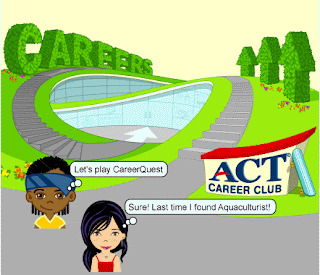 Encourage your child to visit the ACT Career Club and begin the quest for his or her future occupation.